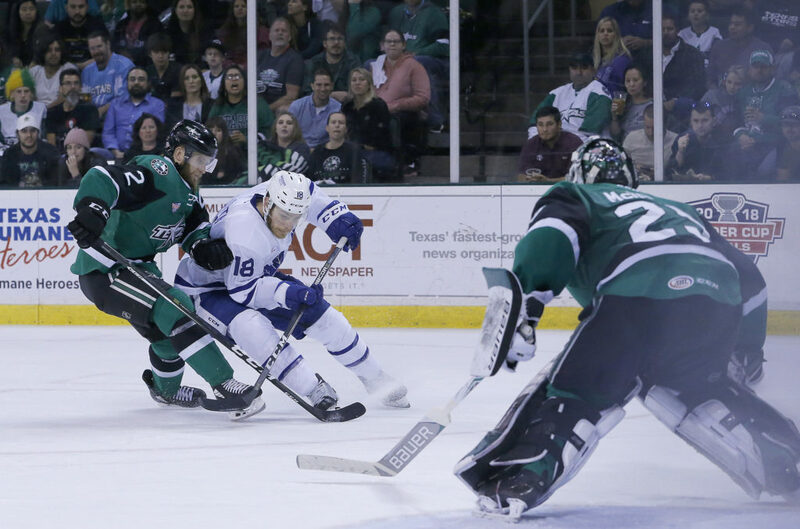 The Toronto Marlies scored a pair of goals in less than a minute Thursday night in Texas, but that would prove to be the only ones Mike McKenna allowed as the Stars won by a 3-2 final to tie the series. Texas converted on a power play to open the scoring midway through the first as Curtis McKenzie found the net. McKenzie added his second of the night six minutes into the second, putting the Marlies down two. Ten minutes later, Dmytro Timashov was credited with the goal to cut the deficit in half as a Stars defender put the puck in his own net. Forty-one seconds after that, Andreas Johnsson finished a give-and-go play with Justin Holl and the Marlies pulled even heading to the intermission. Miro Aaltonen earned the secondary assist. Justin Dowling scored the winner for Texas midway through the third, deflecting a point shot past Sparks’ outstretched pad. Each game in the series has been decided by just a single goal with Game 5 set for Saturday. Sparks had 15 saves in the game while McKenna made 29. Johnsson’s goal was his seventh of the postseason, as he takes sole possession of the team lead and remains the leader for team points with 17. Toronto finished the night 0-for-2 on the power play while Texas was 1-for-2. Dmytro Timashov scored unassisted at 16:11 of the second period. Timashov has 12 points (6 goals, 6 assists) in 17 games this postseason. Andreas Johnsson scored at 16:58 of the second period. Johnsson has 17 points (7 goals, 10 assists) through 13 games this postseason. Johnsson is tied for third overall in the league with his seven goals. Justin Holl recorded the primary assist on Johnsson’s second period goal. Holl has four points (2 goals, 2 assists) in 17 games this postseason. Miro Aaltonen registered the secondary assist on Johnsson’s second period goal. Aaltonen has 11 points (4 goals, 7 assists) in 17 games this postseason. Garret Sparks stopped 15 of 18 shots he faced against the Texas Stars. Sparks is now 12-4 in the playoffs with a .918 Save Percentage and a 2.16 Goals Against Average. Toronto went 1-for-2 on the penalty kill and went 0-for-2 on the power play. Toronto had a 31-18 edge in shots in all situations. Calle Rosen led the Marlies with seven shots on goal. There’s nothing between the two teams. You’re in the Finals, you’ve got the two best teams in the League. I don’t care what happened in the regular season, that’s the best team in the Western Conference. We were the top team in the regular season, they are the top team, as far as I’m concerned, coming out of the west. They earned their way here, they’re playing their best hockey. That’s pretty clear. They’re a big, fast, heavy hockey team and there’s not much between the two teams. Other teams are allowed to be good too and they clearly are a very good team here. It’s a matter of who’s going to find a way to get one more than the other team. That’s really where we’re at here. It’s definitely very close. I think it’s no secret that we’re in for a battle here. We’ve been in a battle so far this series. We’ve got to come ready to play. They’re a team that comes ready, it’s going to be a tough game, Game 5. We’re already looking forward to that one and let go of this one. There will be some things that we have to correct but it’s just a close battle that we have to come out on top of. The Toronto Marlies will look to take a two-game lead in the Calder Cup Finals when they face off for Game 4 in Austin on Thursday night. The Marlies enter the contest having won five straight road playoff games, including Tuesday’s 2-1 win over the Stars. Each of the first three games of the series have been decided by a single goal as both teams continue to play close, tight-checking hockey. The team to score first has also lost every game so far this series, after the teams entered the final with a combined record of 17-0 when scoring first through the first three rounds. Chris Mueller scored in Tuesday’s game to give him a team-lead of four points (2G, 2A) so far this series. Andreas Johnsson, who collected an assist on Mueller’s second period strike, remains first in team scoring with 16 points (6G, 10A) through 12 games this postseason. Travis Morin and Justin Dowling both have four points for Texas and lead the Stars in scoring this series, while Curtis McKenzie’s 17 points (8G, 9A) put him in the Stars’ lead for overall playoff scoring. Puck drop is set for 8:00 PM EST and fans can catch all the action live on Leafs Nation Network, TSN 2 and TSN 1050 Radio. Follow us on Twitter for pre- and post-game coverage, as well as live updates from H-E-B Center.